It has been great to see the energy for reform from people all over the country. Here are some of the places we’ve been on the campaign to renew American democracy. Thursday, October 15, 2015. Durham, NC. Check out this conference on the connections between civil rights and money in politics. I won’t be speaking but I do look forward to joining my colleagues from Free Speech For People and our co-sponsors in this critical conversation. Friday, November 20, 2015. Los Angeles, California. Loyola University Law School. Details to come. Recent events- great to see you! Tuesday April 21, 2015. New Haven, CT. Common Cause Connecticut, 6:30 PM Mory’s, 306 York St. Details here. Saturday, April 18, 2015. Nashua, NH. Patriots Day rally with New Hampshire Rebellion. Details here. Tuesday, February 24, 2015. San Francisco, CA. American Constitution Society. 12:00 noon at Altschuler Berzon LLP, 177 Post Street. Details here. Monday, January 26, 2o15. New York, New York. 6:00 PM at the Brennan Center, Lipton Hall, NYU School of Law, 108 West 3rd Street. Details here. Thursday, January 15, 2015. Cambridge, Massachusetts. 6:00 PM at Workbar, 45 Prospect Street, with Slow Money Boston. Details here. Saturday January 10, 2015. Tucson, Arizona. Antigone Books. 12:00 PM. Sponsored by the Arizona Advocacy Network. Details here. Friday, January 9, 2015. Phoenix, Arizona. Changing Hands Bookstore. 5:30 PM. Sponsored by the Arizona Advocacy Network. Details here. Wednesday, November 19, 2014- Little Rock, Arkansas. 6:00 PM Central. Clinton School of Public Service, University of Arkansas, 1200 President Clinton Avenue. Thanks to Regnat Populus & The Arkansas Democracy Coalition. Details here. Thursday, November 13, 2o14- Lexington, Kentucky. 7:00 pm Unitarian Universalist of Lexington, Kentucky, 3564 Clays Mills Road. Details here. November 10-12, 2014- Louisville, Kentucky. Slow Money National Gathering. Sunday, November 9. Bloomington, Indiana. 3:00 PM Barnes & Noble, 2813 E. 3rd Street. Details here. Thursday, October 30, 2014- Chicago, Illinois. 1:00 PM. Chicago Kent College of Law, 565 W Adams St. (American Constitution Society). Details here. Thursday, October 30, 2o14- Rockford, Illinois. Rockford Public Library- East Branch. Details here. Wednesday, October 29, 2014- Kansas City, Missouri. 6:30 PM, Kansas City Public Library, 14 West 10th Street. Details here. Monday, October 27, 2014- Denver, Colorado. 7:00 PM, The Mercury Cafe, 2199 California St. With David Cobb. Sponsored by Move to Amend and Free Speech For People. Details here. Tuesday, October 14, 2014- Half Moon Bay, California. 6:30 PM Half Moon Bay Brewery, 390 Capistrano Road. Details here. Common Cause w/ Money Out, Voters In; Free Speech For People. Wednesday, October 15, 2014- San Jose, California San Jose Rotary Club. Details here. Sunday, October 12, 2014 – Willits, California. Little Lake Grange, 291 School Street. Details here. Friday, October 10, 2014- Portland, Oregon 7 PM, doors open at 6:30 PM, First Unitarian Church, SW 12th and Salmon St. Joined by KBOO radio. Details here. Friday, October 10, 2014- Portland, Oregon Noon. The American Constitution Society, Stoel Rives, 900 SW Fifth Avenue, Suite 2600. Details here. Wednesday, October 8, 2014- Seattle, Washington. 5:30 PM American Constitution Society, Perkins Coie, 1201 3rd Avenue, Suite 4900. Details here. Tuesday, October 7, 2014- Salt Lake City, Utah. The 31st Annual Jefferson B. Fordham Debate- “Be It Resolved: Corporations Should Not Be Considered People Under the U.S. Constitution.” S.J. Quinney College of Law, University of Utah, 5:30-7:30 PM Details here. Thursday, October 2, 2014- Washington, DC. 4:30 PM 28th Amendment Roadshow, Lafayette Park, H & 17th NW Details here. With the Ben Cohen’s StampStampede & the Amazing Amend-O-Matic Stamp Mobile! Monday, September 29, 2014. Waterville, Maine. 7:00 PM Colby College, Diamond 122. Sponsors: Colby College Govt. Dep’t., Free Speech For People, Common Cause, and Maine Citizens For Clean Elections. Details here. Poster here. Monday, September 22, 2014. Franklin, Massachusetts. 7:30 PM Franklin High School, 218 Oak Street. Details here. Thursday, September 18, 2014. New York, New York. Philanthropy NY- Tune in via public Livestream here. Wednesday, September 17, 2014- Washington, DC.- 6:00 PM- 8:00 PM Democracy Initiative and more. Communications Workers of America, 501 3rd Street, NW. Details here. Friday, September 12, 2014- Arlington, Virginia– 7:00 PM George Mason University, 3434 Washington Blvd. Metropolitan Bldg, Rm. 5183 Details here. Thursday, September 11, 2014– Washington, DC. Women’s National Democratic Club. Details here. Thursday, September 4, 2014- Concord, Massachusetts. The Concord Bookshop, 7:00 PM. Details here. Thursday, April 24, 2014- Berkeley, CA Check out the 28th Amendment Road Show with Money Out, Voters In (MOVI) for details. Saturday, April 26, 2014- Los Angeles, CA Check out the 28th Amendment Road Show with Money Out, Voters In (MOVI) for details. Tuesday, April 29, 2014- Ann Arbor, MI Restoring The Voice of the People, Ann Arbor District Library, Mallets Creek Branch, 3090 E. Eisenhower Pkwy) . Details here. Saturday, May 17, 2014- Waterville, Maine Clean Elections Convention, Maine Citizens For Clean Elections. Details here. Andover, MA Tuesday, April 8, 2014. Andover High School. Bedford, MA Sunday, April 6, 2014. 9:30 AM. The Bedford Lyceum, The First Parish, 75 Great Road. Details here. Washington, DC Tuesday-Wednesday December 10-11, 2013. Common Cause: Blueprint For Democracy. Details here. Stamford, Connecticut Thursday, November 21, 2013 11:00 am. Senior Men’s Association of Stamford, Congregation Agudath Sholom, Colonial Road at Strawberry Hill Avenue. Portland, Oregon Wednesday, May 8, 2013 Illahee Lecture Series. Tickets available here. Boulder, Colorado Monday, April 29, 2013 Slow Money National Gathering Register for this great two-day event here. Portland, Maine Wednesday, March 20, 2013 Details here. Ithaca, New York Wednesday, March 27, 2013 Cornell Law School 5:00 pm. American Constitution Society Details here and here. Saratoga Springs, New York Thursday, March 28, 2013 Skidmore College, The Tang Teaching Museum & Art Gallery, 7:00 pm Details here. Boston, Massachusetts Monday, March 4, 2013 Suffolk University Law School 6:00 p.m. The New England First Amendment Coalition. Details here. Saturday, January 19, 2013, New York City. Money-Out/Voters-In Day of Action. 1:00 – 3:00 pm. New York University, Kimmell Center, 60 Washington Square South, New York. Thursday, January 17, 2013, Lexington, Massachusetts, 7:00-8:30. The Depot in Lexington Center, Representative Jay Kaufman. December 3, 2012, Lexington, Massachusetts. Lexington Community Education, First Parish Church. November 17, 2012 Los Angeles, California. UCLA Law School, Conference on the 28th Amendment. November 9, 2012 Hanover, New Hampshire Dartmouth College, 4:00 pm. More on the Bioneers event here. More about the Laramie, Wyoming event on October 9 here. 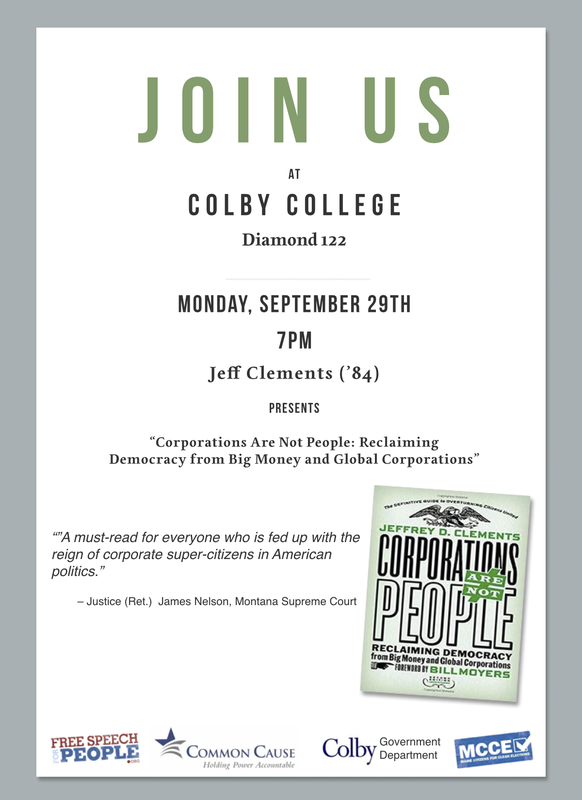 Thanks to the American Constitution Society,University of Wyoming College of Law Chapter, and Free Speech for People. Boulder, CO. Left Hand Books. Pearl Street, 7:00 pm. Details of the Colorado events here. More about the Charlotte, NC event on September 18 here. Thanks to the Charlotte School of Law Chapter of the American Constitution Society, the American Constitution, North Carolina Lawyers Chapter, and Free Speech for People. More about the Washington, DC event on September 13 here. Thanks to Common Cause, Teaching for Change and Busboys and Poets. More about the Westport CT Event on September 12. Thanks to the Westport Chapter of the League of Women Voters, and the League of Women Voters of Fairfield, Norwalk, Ridgefield, Wilton, and Weston. More about the Manchester, CT Event on September 10 Thanks to Manchester Amendment Associates, League of Women Voters-Glastonbury, Common Cause CT, Public Citizen CT, Concerned Connecticut Citizens and Free Speech for People.